Creatives are in a unique position – by looking further afield, gleaning the right insights and ideating concepts that serve a true purpose, we have the ability to educate and inspire others and make a difference to the world. It could be a revolutionary new healthcare product, a piece of art that speaks to a social or environmental issue, or a live brand storytelling experience where a company takes a risk, brings a new narrative to life in a face-to-face setting, and changes up the way their audiences perceive them. Doing good work, and that’s across the entire creative spectrum, comes down to two things. The first is the relationship you foster with your clients, customers or audiences – whether it’s a corporate brand, a not-for-profit organisation, or a husband and wife team who run a local café. If we take a humble approach and stay true to ourselves, we’ll build a unique level of trust with these people. The second, and this is only really achievable when the first element is on point, is having the bravery and proactiveness to challenge the status quo and introduce them to a different way of thinking. As the saying goes, great things never came from comfort zones. Be bold, daring and disruptive – don’t be afraid to take that giant leap outside of the confines of the ‘normal,’ and encourage others to do the same. And by giant leap I mean remove yourself from the rules and regulations of the city, or head offline for a few days and take the time to be present in the real world. You’ll return with fresh ideas and inspiration ripe and ready to apply to a new brief or product ideation, which will more than likely help a business, organisation or individual achieve their goals in ways they probably never thought possible. Storytelling is an age-old art form, and the most successful ones, those that we continue to read and share today, engage people in emotive ways. Millennials and gen Z’s, our future. are not only gaining more and more spending power, they can see straight through marketing that isn’t genuine. They buy and engage with products, services, causes and experiences that they believe in and feel deeply about. Focus on telling real, authentic stories, the ones that people can relate to. Instead of looking at what a product or service does, which is the way we naturally tend to approach things from a creative perspective, consider the ‘why.’ Why do creators create? Why does this product need to exist? If we consider the why first, and the what second, we’ll be crafting stories that resonate with others – they can see that whatever the creation may be, it serves a purpose in one way or another. For creativity to live a long, prosperous life, creators of the now really need to mentor the creators of the future. Traditional mentoring in a classroom or shadowing is valuable for sure, but if we want unique thinkers, we need to encourage them to actually look beyond the confines of what we consider to be ‘normal’. When I am lecturing or working with those keen to get into the creative profession, for example, I run a session called the ‘you brief,’ where students tackle what will be their most important project of all – themselves. We should all create and constantly fine tune our own personal identities and stick to them wholeheartedly – this could be a punk persona, or a preppy one. Whatever the identity they choose, I encourage budding creatives to stick to it. After all, it’s what clients, employers, partners and suppliers ultimately buy into. Some of the best creatives I’ve come across didn’t take the traditional ‘creative’ route – it’s the life experiences they’ve endured throughout the journey that we call life that punctuates their work. If we encourage the next generation to get out there and see the world, grasp at the unknown and embrace whatever life throws at them, our creators of the future will be firmly set up to ideate, conceptualise and bring to life genuinely awesome things. So, by embracing these steps we’re well on the way to producing compelling creative that has the ability to make a real, tangible difference – both now and into the future. 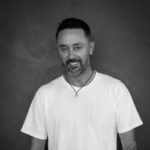 Adam Harriden is the Executive Creative Director of INVNT official production partner of TEDxSydney 2018 and 2019.